S400 Turbo too big for 1991 E7-350???? Would a Borg Warner S400G073 turbo be too much for a E7-350 to handle? The motor is not turned up at all and has all it's oem parts. There is one for sale locally to me brand new but don't know if it will do me any good. I'm starting to see some oil residue on my v-clamp on my turbo outlet so thinking it may be time. Currently it has a S3a038 turbo on it now. Truck runs good but still seems like it could do better. Relay Valve? Not able to feather into brakes?? Would a relay Valve be the culprit for having nothing happen for the top 1/4 of my brake pedal? I have read a sticky relay Valve will show the symptom of not being able to feather into the brakes but I have 3 relay valves and don't know how to diagnose which it may be. The truck is a 91 rd688s Tri axle dump. I was going to change the foot Valve until I read it may be a relay Valve which looks easier to change than a foot Valve. This makes for a white knuckle ride in the rain when all the brakes want to do is lock up on you and you slide to a stop every traffic light. Clunk coming from the back of the truck when starting to accelerate and brake. I have a clunk almost as if a torque arm was bad on my 1991 rd688s with 44k Camelback. Spring shop says suspention looks good possibly in the driveline. It's a identical feel to a bad torque arm...I changed 1 torque arm that had play in it but the thud I get from the back of the truck when I dump the clutch at say a stop light and when I brake hard at low speed is still there...any ideas on a diagnosis? I put a reman forward rear in about 50,000 and run same tread depth tires on all 8 drives all the time as to not tear up rears. I am the only driver the truck has seen since I bought it in 2009. I am getting ready to do a ac system overhaul. I have had this 91 rd688s for 6 years and dont remember if the ac ever worked or not but 6 years of no ac has been enough. A line came off the compressor and the system became open so i am going to start by changing the compressor reciever drier and all hoses and see it it holds pressure...but before i tear into all of that when i switch on the max ac from the control panel and fan on high ( i hear a significant air leak but.. ) the air flow that comes out of the vents is minimal to nothing. What should i check before i start tearing everything apart...this hvac control is relativly new and installed by mack a few years ago. I recently swapped hubs and went to a wider tire now I have about 2.5" of tire outside of the edges of my fenders...probably not pa legal. I'd like to utilize the fasteners and holes this hood currently has for oem flares or I will have to use a side mount universal flare such as pacer flexy flares. 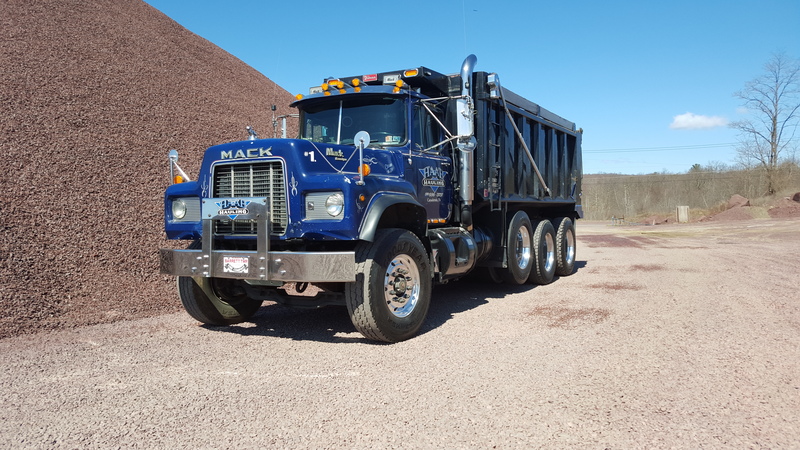 Does anyone know a Mack part number or anywhere other than Mack that may carry these oem style flares? I have been buying mainly universal things to spruce my 1991 rd up. Chrome vinyl is a cheap way to chrome harder to come by parts. But things like switching lights to led and using chrome bezels where ever you can make a good appearance. New Mudflaps and weights behind the front axle and in front of the front drive axle hanging off the box would look good to...I also use nut covers where ever I can too. I so found on the interior that Peterbilt gauge covers with a dab of clear silicone and toggle extensions and I think it was Peterbilt swich id plate bezels fit too. And a can of paint on the dash and cab plastics dresses thing up nice for cheap too. And if your not in the paver all the time i think it looks good to add center flaps ( or one big 48" wide piece of old cleaned up quarry conveyor belt like I did before I started Paving alot ) but you have to fabricate up a mount then. While we are talking cables, does any one know what the proper black plastic adapter that comes with a new cable is to use, I believe the adapter for the speedometer is OK in my truck but I have a feeling my tach cable has the wrong one as my hours on the hour meter never add up...seems like its well behind. Speedometer works & the odometer flat out quit working. The pin for the speedometer jumps about 5mph of where its suppose to be. Can this be fixed or do ii need to start at 0mi again with a new one?